This live album is what happened when a blues-rock band got to stretch out and play without limits. It’s what I dreamed of doing when I left Indiana and moved to Nashville, Tennessee — to play guitar in the epicenter of the best music in the world. At its core, the Mark Robinson Band consists of Mark Robinson (me) on guitar and vocals, Daniel Seymour on bass, and Rick Schell on drums. We’ve been playing together for some time now, but recently we’ve been evolving in our live performances, playing deeper grooves, taking longer solos, mixing it up with tempo changes — taking chances, going out on a limb, and then bringing it back in. We did a series of shows late last year at East Nashville’s fabled bar The 5 Spot. It didn’t occur to me that the performances would turn into my first live album. After the gig, though, we all knew that something special had happened at those shows. The band — along with some very talented guests — had gone where few bands get to go. And The 5 Spot had recorded it all. Those recordings really captured the energy and synergy of what we do when we perform in front of an audience. So now, with a little help from my friends, is the CD, The Mark Robinson Band Live at The Five Spot. Blues, jazz, rock, country, soul and even a bit of psychedelia end up in extended jams that dig deep into the songs, the instruments, the players — into the heart of the music. We are not your standard blues band. We rock hard, we swing, we take off on musical excursions. It’s all about interaction, all of us improvising together. NASHVILLE — Guitar slinger-songwriter Mark Robinson, whose first two albums were named to several “Best Of” blues and blues-rock lists, will release a new digital single, Gone South, on September 11 — and it’s going to surprise a lot of folks who thought they had him pegged solidly in the blues genre. But Gone South is not blues, not blues-rock. It’s hard electric rock, the kind of rock that would fit on a DJ’s playlist alongside Mountain, The James Gang, or My Morning Jacket. And it’s also acoustic roots, in the vein of Sam Lewis, The California Honeydrops, or The SteelDrivers. 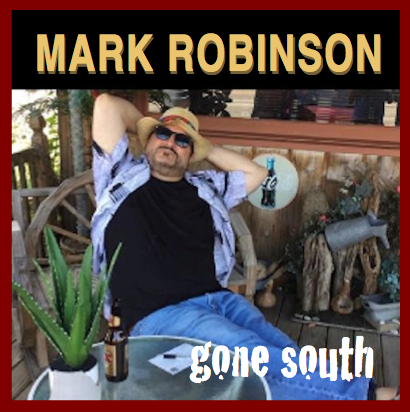 “Gone South” is both electric rock and acoustic roots because Robinson recorded two versions of the song, and he’s releasing them simultaneously. In the spirit of classic vinyl 45s, the digital single Gone South has two “sides”: one electric rock, one acoustic roots. Then listeners can decide for themselves which is A and which is B (a very quick, very unscientific poll of Robinson’s fans resulted in a virtual dead heat). HAVE AXE - WILL GROOVE (2013) Named to multiple "best of" lists — Listen to the album on SoundCloud here. Best of 2013 BLUES MATTERS! The results of the BLUES MATTERS! 2013 Writers' Poll were just published, and 'Have Axe - Will Groove' was "In with a Shout" for International Studio Album and Mark Robinson was "In with a Shout" for International Solo Artist. Amazing list of artists and albums in the poll--great to be among their company. Thank you, BLUES MATTERS! writers. ABOUT.COM BLUES puts 'Have Axe - Will Groove' in its Top 10 Blues-Rock Albums of 2013! Thanks, Reverend Keith! 'Have Axe - Will Groove' Named to Top 10 Blues-Rock Albums USA 2013 by Blues Underground Network! Thanks, John! BLUES VAN puts 'Have Axe - Will Groove' in its Top 15 Blues Albums of 2013! Great to know we have fans in Hungary, too! Thanks, Blues Van! THE ALTERNATE ROOT puts 'Have Axe - Will Groove' in with some pretty great company at #49 on its list of the Top 100 roots albums of 2013! Thanks, Alternate Root! BROKEN JUKEBOX has announced that 'Have Axe - Will Groove' made its Top 25 Albums of 2013, joining a stellar list of roots projects. Thank you, Adam Dawson and BROKEN JUKEBOX! Have Axe - Will Groove Nominated for 2014 IBC "Best Self-Produced CD"
The Nashville Blues Society has nominated Have Axe - Will Groove for the "Best Self-Produced CD" in the 2014 International Blues ﻿Challenge!